The skin color changes because of less underlying blood flow. and the shape becomes collapsed and droopy as muscle and collagen decrease. Also the texture of the skin becomes less smooth. As a result, the person looks “worn”, or “tired” or “droopy” The lively, rosy hue seen in children of every skin color fades to a dull gray. Balancing Your Decision – With so many ways to improve the face and with countless products and procedures available, why look for a better way? With hyaluronic acid (HA) fillers, the face is truly lifted away from the bone and youthful volume can be restored to a beautiful shape. With that in mind, the HA fillers should not be used around specific areas near the eye. Furthermore, the injector must be careful to avoid creating a shape that looks foreign to the person’s face or even foreign to this planet. Also, the HA fillers are not extremely effective for improving skin tone and texture. Creating The Shape – The first part of the Vampire FaceLift® Procedure™ utilizing HA fillers to begin sculpting specific areas of the face. The glycosaminoglycans (what an HA filler replaces) act like a sponge that holds water in the face providing a basic shape. This initial injection of HA is the precursor to the ultimate desired form. Next comes the polishing and refining step of the sculpting process which ultimately contributes to the appearance of a younger version of you. Platelet-rich plasma is similar to HA fillers because it can be injected to sculpt the face. But, here’s the best part: not only does the PRP cause an increase in the volume, PRP contains at least 8 growth factors that will over a long period of time, continually work like a rejuvenating agent. The skin color becomes a “younger” color because of newblood vessel formation. New collagen formations in the dermis lifts the face back to amore youthful shape. 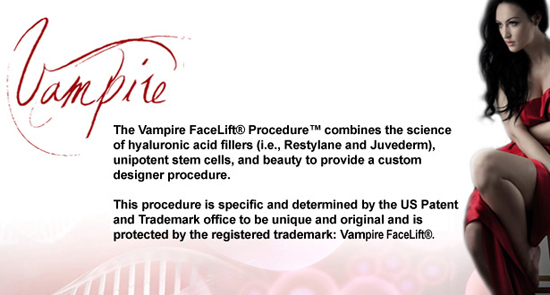 The third and final part of the Vampire FaceLift® Procedure™ impliments the science and mathematics of pure beauty. As far back as Leonardo da Vinci up until the present day, physicians, scientists and artists have worked to define what shapes, contours and proportions make a face more beautiful. Is The Vampire FaceLift® Procedure™ Right For You? The procedure may be too much for some and not enough for others, but you don’t need to wonder. Simply contact us either by phone or by e-mail and tell us you would like to know more about the Vampire Facelift. We’ll make sure you understand the procedure and can arrange a cosmetic evaluation based upon these powerful ideas about restoring beauty. Experience the journey of the Vampire FaceLift® with an expert by your side!